Toronto is considering measures to reduce the amount of packaging that winds up in landfills, including requiring cafés to provide a 20-cent discount for customers with refillable mugs, banning paper coffee cups with plastic lids by the end of next year, making stores give customers with reusable shopping bags a 10-cent rebate and barring the sale of bottled water on city property. Many environmentally minded folks also crammed the room where the public works committee is considering the packaging-reduction strategy today, among them Grade 6 students from The York School who called for a ban on plastic bags. A couple of media articles based on a new Toronto policy highlight the difficult arguments to be teased out in selecting materials. 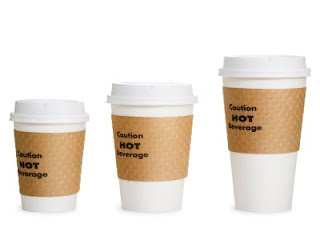 The world's first major move against takeaway coffee cups - which are now a major part of Britain's catering business and roadside litter - has come from the city of Toronto. Failure to comply will mean a $100-$400 fine per cup for vendors. It has, however, caused a storm among environmentalists, who find it illogical.